Schools out, it is summer vacation time, but why not add a fun academic “twist” in today for Science Saturday. 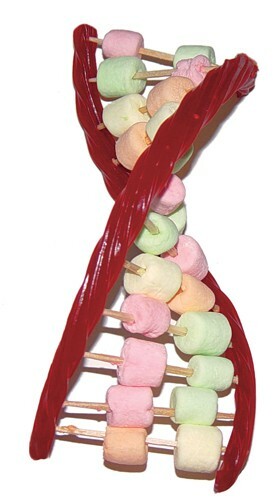 Build a candy double helix. All you will need is licorice, tooth picks and mini marshmallows. The double helix is the most recognizable structure for deoxyribonucleic acid, also known as DNA. Double helix is the name for the structure formed by double-stranded molecules of nucleic acids. In short, it the the shape of the molecule where all the genetic information is stored for all organisms. Inside every cell of each living thing, both plant or animal, there are sets of instructions called genes. The genes provide the instructions on what is the plant or animal, what it looks like, how it is to survive, and how it will interact with its surrounding environment. The genes are strung together in long stands of material called deoxyribonucleic acid (DNA) and these long strands are called chromosomes. Most living things have pairs of chromosomes (one from each parent), though they may have a different number of chromosomes from another living thing. For example, humans have 23 pairs of chromosomes and the fruit fly has 4 pairs. Each gene is made up of long combinations of four different nucleotide bases. It is the various combinations of the nucleotide bases that determine everything about a living creature. Bonus: This Science Saturday offers some tasty left over building material! Do you know how mountains are made? We made that blog will educate you and your kiddos on the three different types of plate tectonic boundaries divergent, convergent, and transform plate boundaries. With this edible experiment you will see the testing of the convergent boundaries, where two plates push together and form mountains. By pushing the graham crackers together the kids will actually be forming a mountain that they can eat after learning. Science Saturday: How mountains are made. Take the traditional rock candy string experiment to the next level by making these tasty geodes. It’s all about crystallization achieved through total saturation with this experiment. Learn how to make these realistic looking candy creations at howtocookthat.net. Science Saturday: Without the use of a microscope you can learn all about how crystals form. Here is an egg-cellent science experiment from science-sparks.com and it will have everyone cringing while little hands squeeze a fragile egg. Give it a try…now try harder. You will never accomplish breaking that egg. Really! Well you can crack it into a pan for breakfast and then eat it. Science Saturday: The egg’s shape clearly makes it much stronger than it looks. It’s time to let our butterflies go. For this week’s Science Saturday it’s time to say goodbye. It was just three weeks ago that our Butterfly Keeper, Erin, received a package from Insect Lore with a larval culture cup. Since then, we watched as the caterpillars ate until their bellies were full enough to develop and enter into the pupal stage. During this stage of the butterfly’s lifecycle, Erin came to work to find that all the caterpillars had crawled to the top of the cup and were hanging upside down. It only took 2 days for the caterpillars to curl up and harden into iridescent chrysalides and from there we all anxiously waited until they hatched into beautiful Painted Lady butterflies. A butterfly starts life on the leaves of a plant as a very small, round, oval or cylindrical egg. When the egg finally hatches, caterpillars emerge and begin eating until they have enough nutrients so they can grow quickly. Once they have eaten enough, they enter the pupal stage. During this stage the caterpillars will hang upside-down and the magic begins! From the outside it may look like the caterpillar is just resting, but inside the old body parts of the caterpillar are undergoing remarkable transformation. Finally, the caterpillar emerges as beautiful butterflies, completing their metamorphosis! 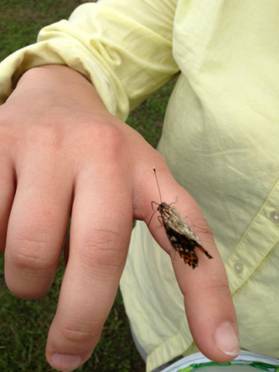 Pictures of our Butterfly Keeper, Erin, getting ready to say goodbye to her babies. Erin helping her last butterfly soar into the world. Watch ants create 3-D tunnels in the amazing space gel. And, this weeks Science Saturday, the Live Butterfly Garden. – be your own Butterfly Keeper this summer! What first comes to mind when you think of Seattle? Did I hear you say rain? 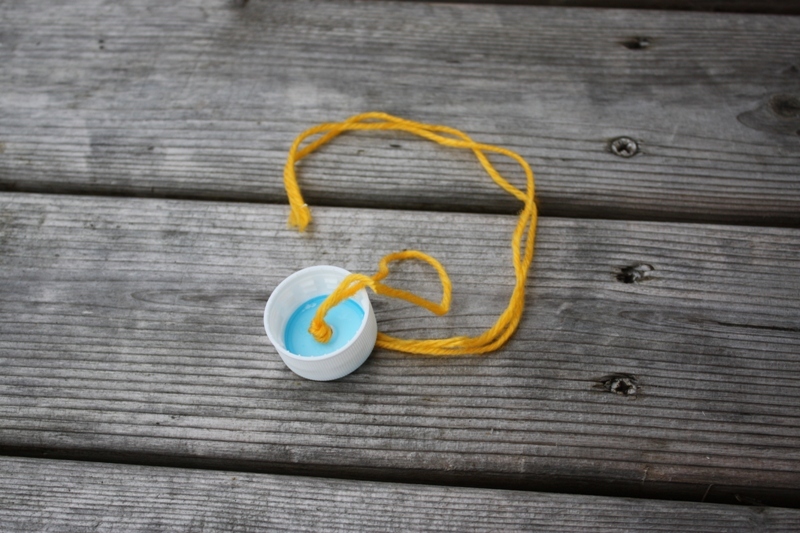 This week’s Science Saturday project is about water and is from Seattle. 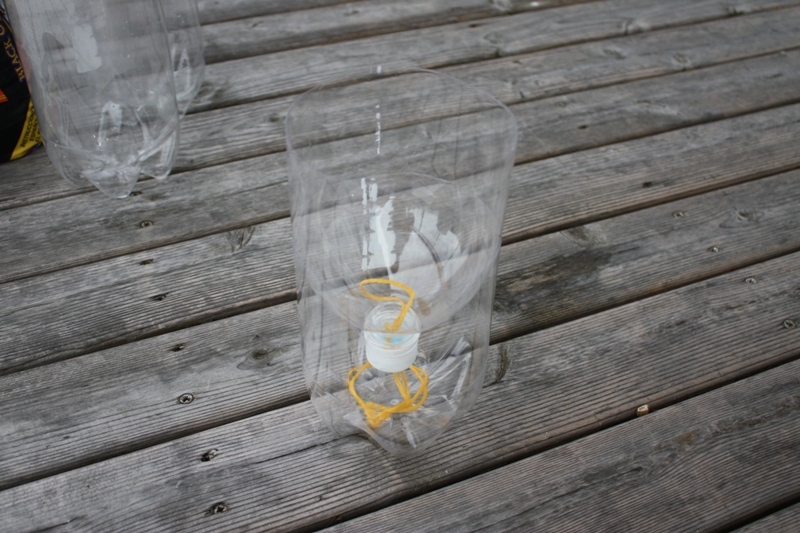 Anne, a Seattle mother of three, shares her pictorial How to: Self-Watering Seed Starter Pots. Who better to know about water than a Seattlite, right? It’s still a little too early for starting seeds here in northern Minnesota, but I am anxious to give this ingenious method a try. 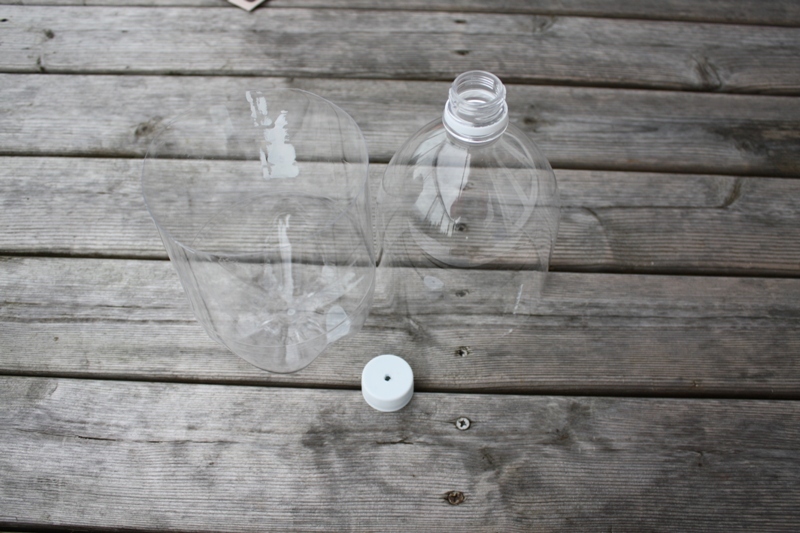 Also with Earth Day around the corner, we’ll add this to our list of ways to reuse plastic soda bottles. A few weeks ago the girls and I did a project that I’ve been enjoying every day since. We repurposed 2 liter bottles and turned them into self-watering planters for starting our tomatoes and cucumbers indoors. They’ve been sitting on the window sill near my desk and I’ve been watching them grow every day. It’s been the perfect antidote for the bummer weather we’ve been having here in Seattle. I’ve tried starting seeds indoors several different ways over the years. So far this is my favorite method because the soil is always exactly the right moisture level and it’s very easy to see with the naked eye when it’s time to add water to the planter. There’s no guesswork involved and the plants seem to love it. Cut a length of yarn/string about 1′-1.5′ long, double it over and tie a loop on one end. Anne is also a talented soap maker with a fantastic line of artisan soaps at Seattle Sundries. Here is her latest, and with a currently very dirty Shop Dog Higgins, must say greatest soap. But really, you have to take a look at the packaging, each one is more clever than the other. The list goes round and round, like Bitchn’ Kitchen, Potty Mouth, Gender Neutral to Manly Man. You can even private label soaps for wedding favors, corporate events, etc. Thanks for all your inspiration Anne! While I’m still thinking “water” and am inspired – better make it bath time for Higgins. Science Saturday adjourned. Now, with any left over min-marshmallows, get out your marshmallow shooter, load it up and have some fun.